Our Test Tags are our most customisable product. Choose from Self-Laminating, All Purpose, Industrial Strength or create your own bespoke size. Click on Ordering Details to request a quote! Jtagz® caters for small and large orders with a 500 minimum order (Custom Test Tags only) and an unlimited maximum print run. Artwork and colour must be the same for the minimum 500 tags. Please Select which products you require a quotation for. Minimum quantity of 500 Test Tags per design applies. Please advise the border colour you require for your test tags. Do you require a barcode to be printed on your Test Tags? Please advise the start number or data to be encrypted on your barcode. 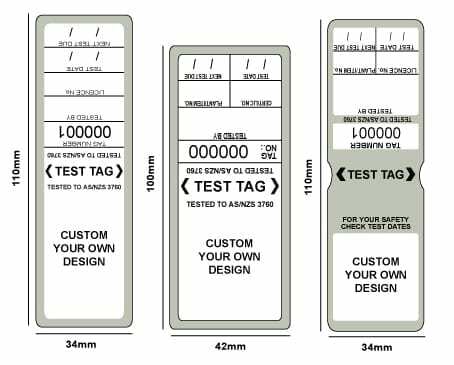 Do you require a numbering sequence to be printed on your Test Tags? Please advise the starting number for your numbering sequence. For consecutive numbering printing we have a minimum of 6 numbers. Letters are also available for print, you can choose to add letters in front of the minimum 6 numbering sequence. E.g. CLK000001 – CLK000200.